Today’s fun fact is again brought to you by The Tico Times. With Luis Guillermo Solís now in office as Costa Rica’s 47th President and academic celebrations underway at UGA as many students graduate this weekend, we thought it would be fun to share a fun academic fact about President Solís. Did you know…that President Solís actually has 30 years of experience as an educator? Even more interesting is that he has taught in the U.S. at two universities. Just as the United States celebrates Labor Day, Costa Rica also observes Labor Day as a national holiday. However, in Costa Rica Labor Day is celebrated on May 1 (it’s the first Monday of September in the U.S.) and is also called May Day. According to The Tico Times, “Every year on May 1, demonstrators march to the Legislative Assembly in downtown San José to celebrate Labor Day.” Check out their article on this year’s march here. 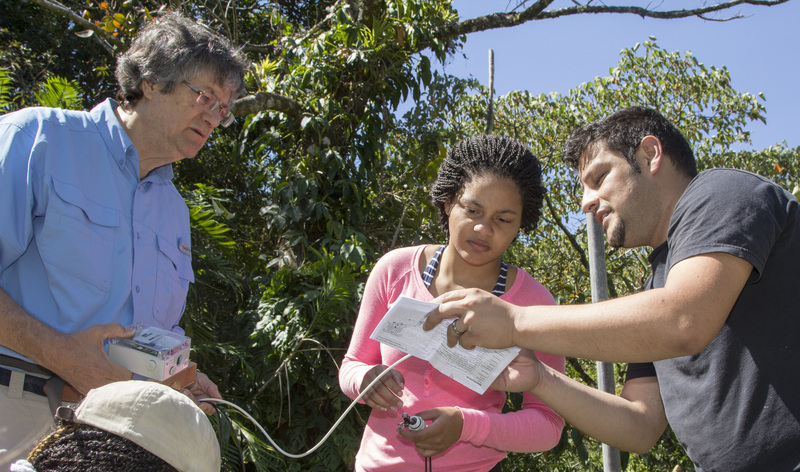 This spring, our students had the opportunity to set up two weather stations as part of an ecology lab and ongoing research project. 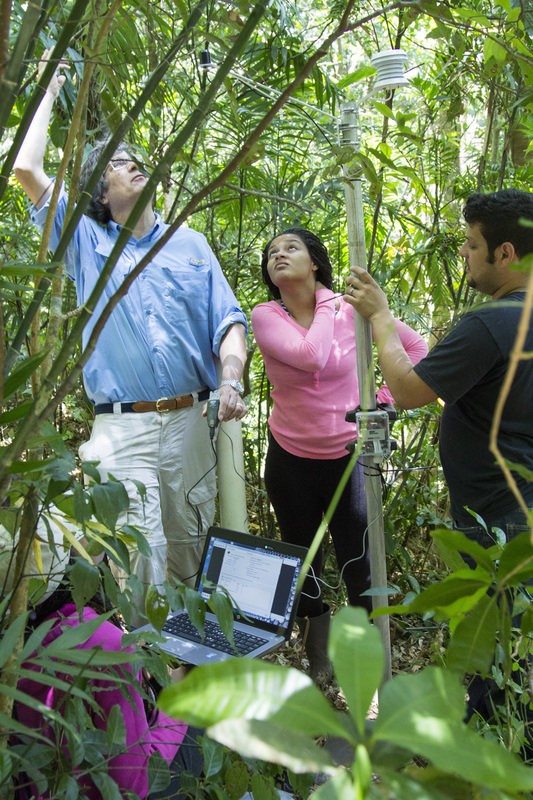 Under the guidance of Dr. Jim Porter and head naturalist Arturo Cruz, they set up two stations to record weather data on the UGA Costa Rica campus. One sits in our medicinal garden in an open area that receives much sunlight. The other is just off the Camino Real Trail under the cover of the forest. Dr. Porter expects higher relative humidity in the forest and higher solar radiation in the open garden area. However, how the forest environment effects temperature has yet to be seen. The forests environment heavily relies on high relative humidity. Some past alumni and guests of our campus might wonder, “Isn’t there already a weather station on campus?” Yes, we have a full weather station that is part of the Georgia Automated Environmental Monitoring Network. It takes measurements on temperature, humidity, dew point, wind speed and direction, atmospheric pressure, and soil moisture, among other things. Although information on the daily weather conditions can stand alone, it becomes even more useful when paired with other research. For example, our moth researcher Philip Barnette documents moths every day at 2:30 in the morning. These weather conditions could be very useful in the interpretation and analysis of the project’s data. Lucky visitors to UGACR may get a chance to see or hear the Montezuma Oropendola, one of the nearly 230 bird species present in San Luis. This mouthful belongs to the family Icteridae, which includes the more commonly known blackbirds and orioles. The Montezuma Oropendola’s beautiful colors and unique behaviors make it a fascinating bird to learn about and is one of my personal favorites to observe. Though watching the male’s display is always a thrill, as they bow from their perches, flipping completely upside down while raising their wings and bright yellow tails, gurgling loudly (this impresses the ladies), one of the most interesting aspects of the Montezuma Oropendola is its nesting behavior. Preeminent biologists Stiles and Skutch call oropendolas “the most impressive weavers in the Western world,” and indeed, the nest of an oropendola is quite a sight to see (1989). The colonial oropendolas weave long, pendulous nests to defend against predators. They locate their nests in communal trees, typically in open areas, making them easy for any birder to spot. This strategy provides some defense against the hungry, egg-stealing monkeys who are typically reluctant to cross open ground. Locating their colonies close to those of bees and wasps who will readily attack intruders also protects the oropendolas from predators. 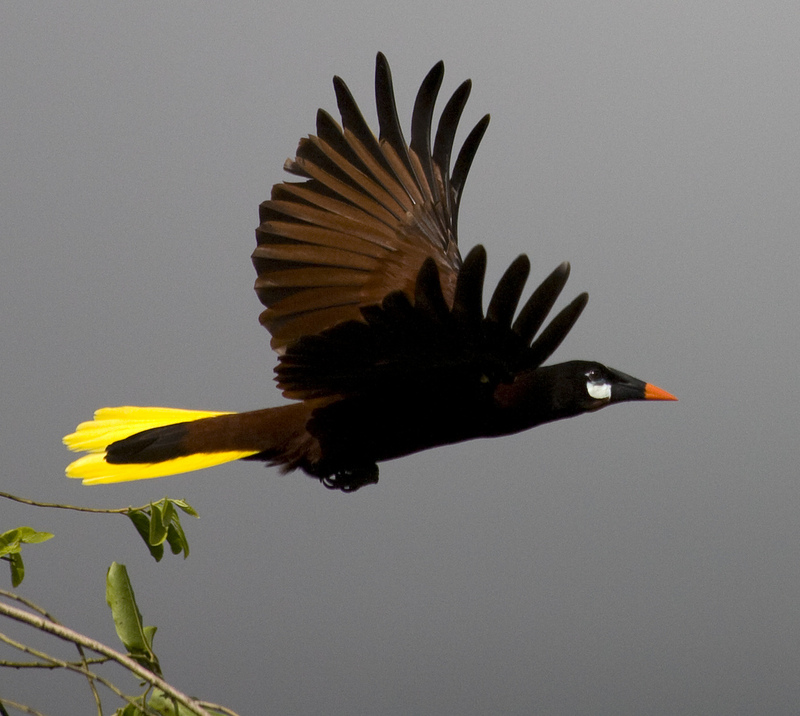 Travelers can find three of the thirteen Neotropical species of Oropendolas throughout Costa Rica and most commonly see the Montezuma Oropendola on campus, though they may see the Chestnut-Headed Oropendola as well. The Montezuma Oropendola is just one of many exciting birds that visitors can see here on campus at UGACR. This Friday Fun Fact and bird expertise were contributed by Resident Naturalist Lillie Kline. 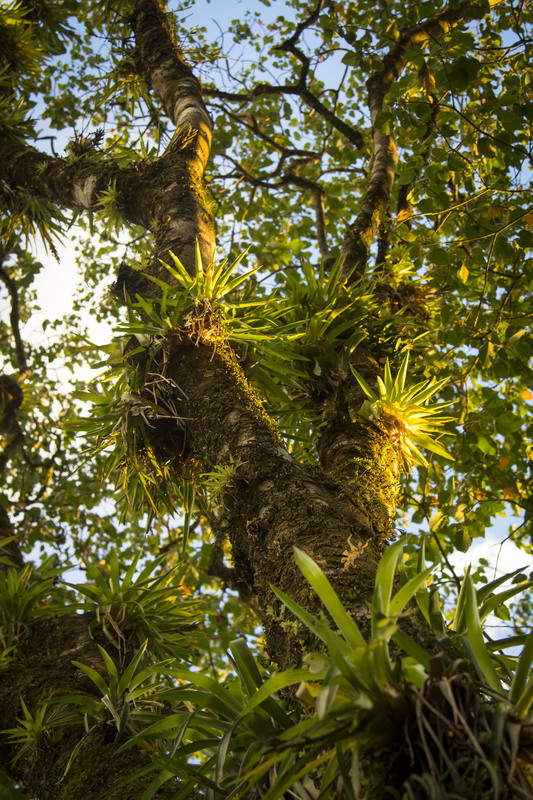 Bromeliads are much more than just all the stuff growing on trees. Yes, they are leafy epiphytes in the same family as pineapples, but they are also much more. Wrapped in their leaves is the story of the hunt for food, search for a home, and the adaptations that have arisen from the cut-throat, competitive environment of the cloud forest. Let’s start at the very top — the top of the food chain, that is. Monkeys, resourceful scavengers that they are, know to look through bromeliads for the frogs, insects, salamanders, and even crabs that make their home there. As they go, they tear off the leaves and scatter them along the forest floor. The tasty treats monkeys look for are attracted to the bromeliads by the moisture that their spiraled leaves collect so well. There are even some species of Euphonia birds who make their nests in bromeliads. Although they are not parasitic, eventually the weight of the many plants growing on a tree can hinder its growth. And don’t forget about all the water and insects and animals hidden inside. Their very shape is an adaptation that allows Bromeliads to collect water in the harsh rainforest environment. Now that you appreciate the special place bromeliads have in this ecosystem, you will have to come to see them here in Costa Rica! Feb 2nd Election: The television showed the votes as the results began to come in early in the night. Big news from Costa Rica! On February 7th, we posted the fact that the election was inconclusive and neither candidate had received the necessary 40% to win the election. A new run-off election was called for April 6th, but in a shocking turn of events, one of the two remaining presidential candidates, Johnny Araya, has withdrawn from the race! Based on recent opinion polls suggesting that he was lagging far behind the other candidate with only 21% of voters likely to back him, Mr. Araya felt that it was a sensible decision to withdraw his candidacy. “It is only prudent not to spend millions on publicity, meetings and other events. We will respect the constitutional provisions, but I will refrain from any electoral activity,” he told reporters. A campaign poster hangs in the window of our local pulpería, or grocery store. 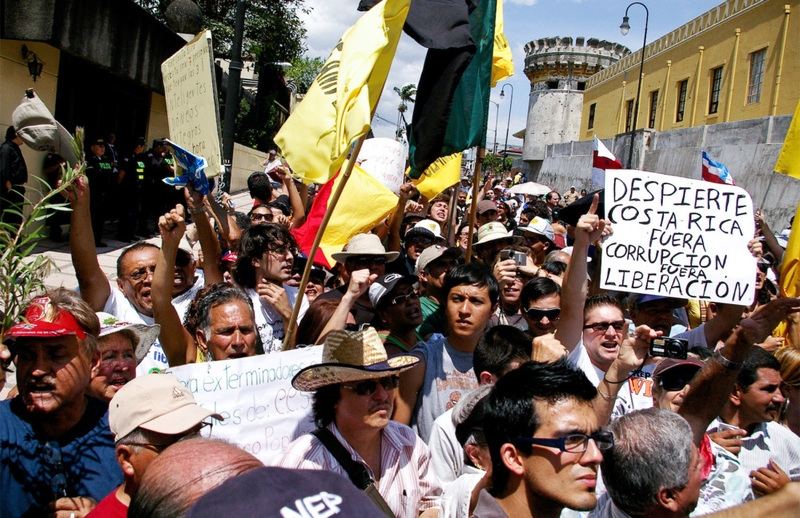 Despite his withdrawal, Costa Rica’s laws actually do not permit candidates to drop out. 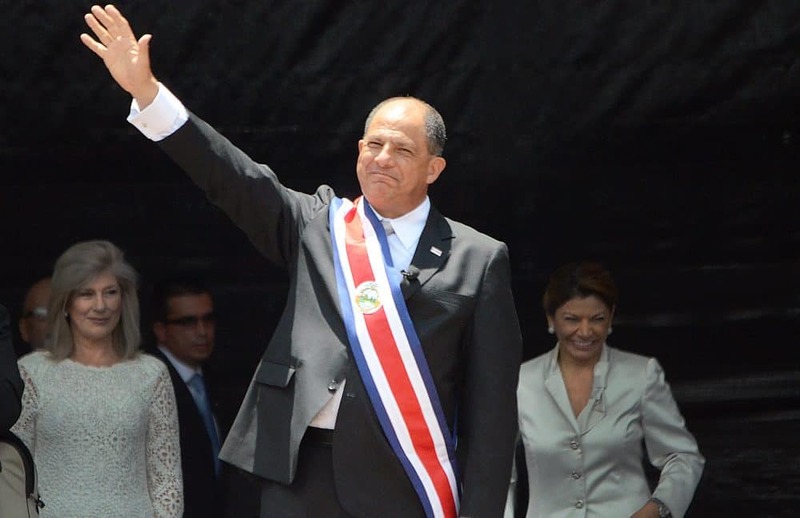 Johnny Araya’s name will appear on the ballot during the April 6th election, but this surprise decision opens the way for Araya’s opponent Luis Guillermo Solís, of the political party PAC, to be Costa Rica’s next president! 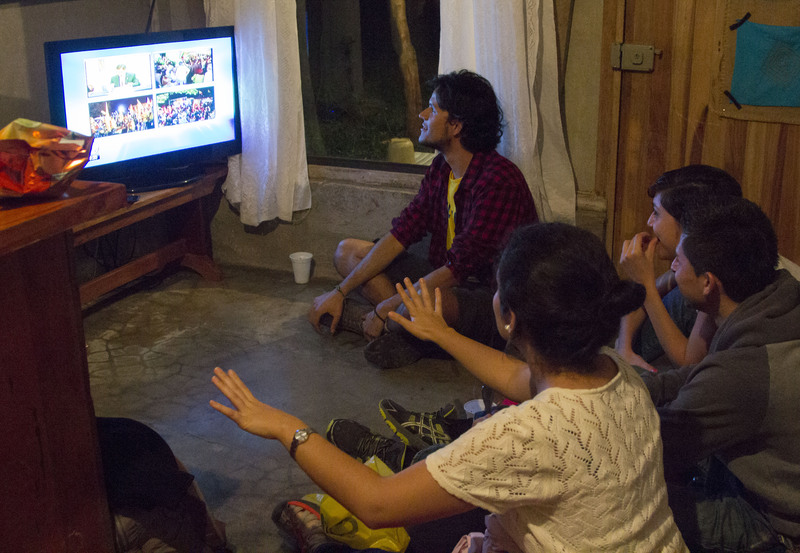 Feb 2nd Election: UGA Costa Rica staff gather to watch as the results come in election night. Bonus Fun Fact: The founder of the PAC political party, Ottón Solís is actually an instructor of international affairs at UGA Costa Rica! 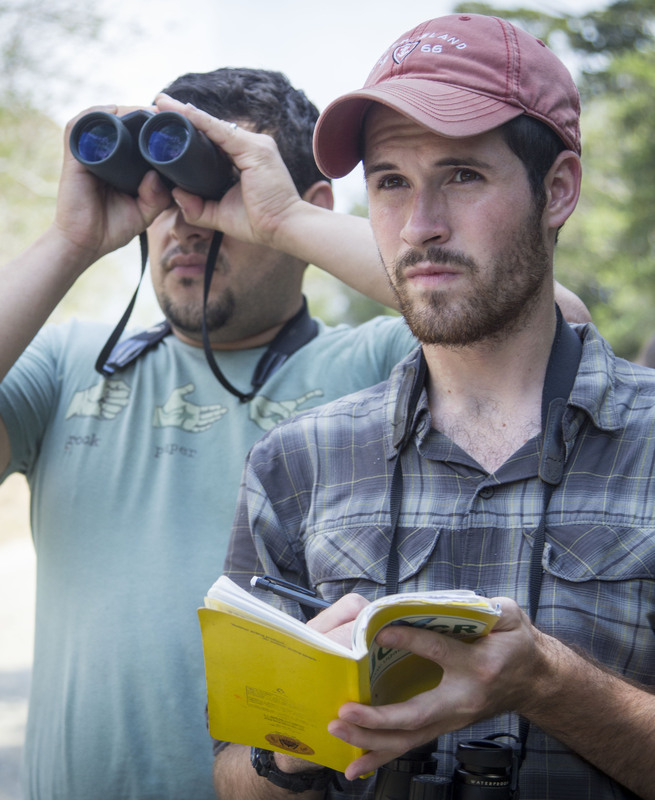 Arturo Cruz (left) takes a closer look through his binoculars while naturalist Jamie Alfieri (right) records the sighting. 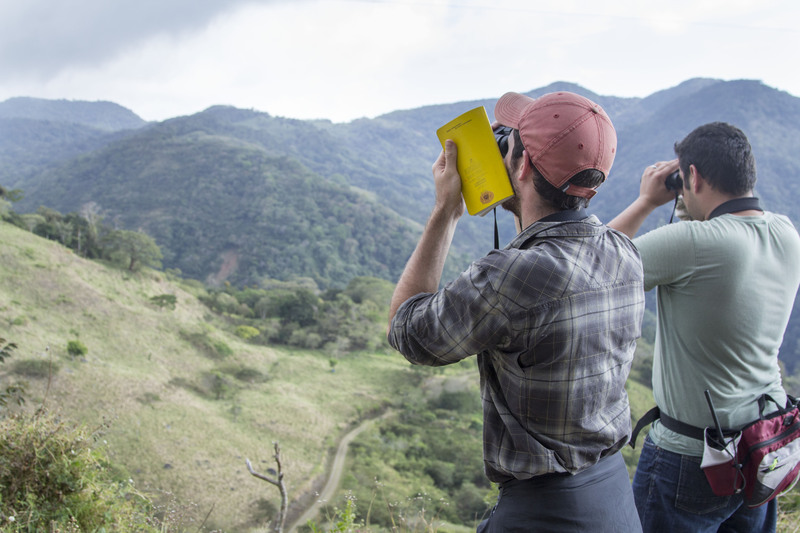 Once a month, bird watchers set out from the UGA Costa Rica campus, looking for anything with two wings. An experienced birder knows that brief flash of color above is a Crimson-fronted Parakeet as it sweeps across an opening in the trees. There’s a lot to take in: color, size, bill shape, behavior, tail shape, posture, markings. Does this one shuffle along the ground like a sparrow? Or does he perch on the trunk of a tree like a woodpecker? Sometimes it can be difficult to keep up, as the names of birds begin to fly by. We hear the sing-song catcall of a Squirrel Cuckoo and add it to the list. A rooster crows in the distance. “Pollo!” someone jokes. 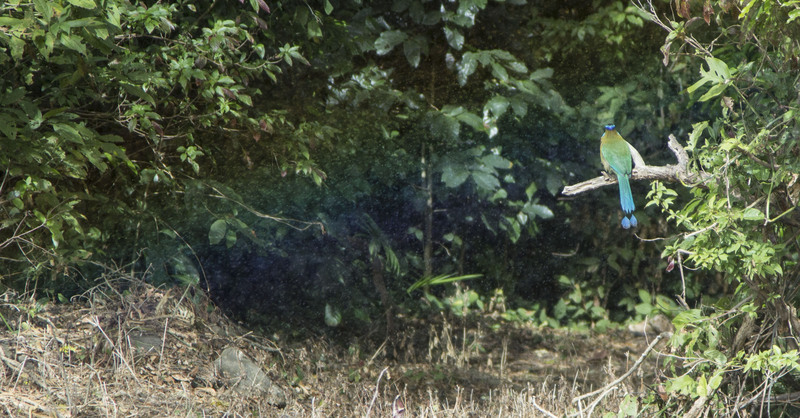 A rainbow appears in the mist next to a Blue-crowned Motmot. We saw 15 during the February bird count. This time our group is made up of our resident naturalists and head naturalist Arturo Cruz, our garden curator Lucas Ramírez, as well as Russ Kumai and Carol Cameron, friends of UGA Costa Rica and experienced birders. Anyone from the most experienced veteran to a novice is welcome to come along. Armed with binoculars and a notepad, we collect vital information about the bird population in the area. Such counts have been conducted by the University of Georgia here since 2009. 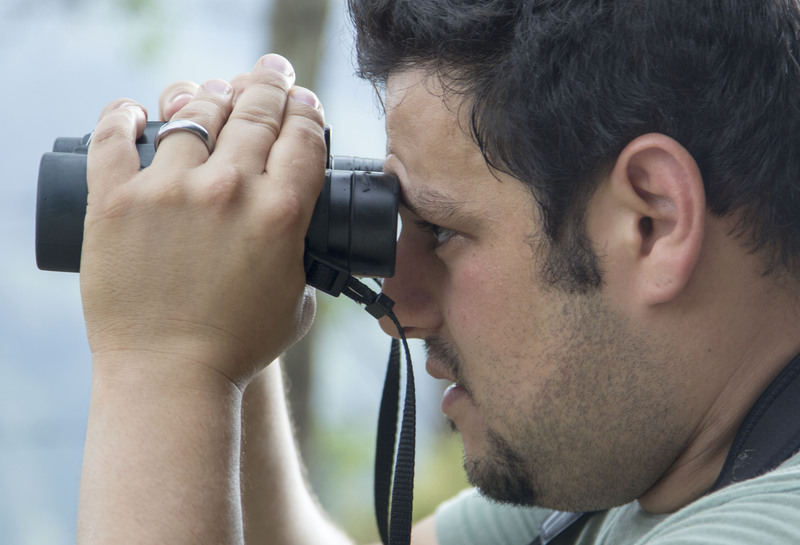 Head Naturalist Arturo Cruz takes a closer look with his binoculars. “Where the campus is located is really interesting because we have a whole bunch of conditions and many microclimates, which means we have many species,” explains Arturo. The campus is a perfect transitional spot that sees species from both the Pacific and Caribbean sides of the continental divide. San Luis alone has 230 bird species, with 624 in the larger area of Monteverde. Counting birds can show patterns in behavior like migration. Arturo has noticed Black and White Warblers and Chestnut-sided Warblers usually arrive one to two weeks before other variations of warblers in October. The bird count extends well beyond campus, from the Rancho Rio de San Luis Pizzeria, through the farms of Finca La Bella, and down to Invu. The area is divided up into 13 zones, although the number surveyed every month depends on how many people participate. During the Christmas Day bird count – the most extensive effort all year – it is common to find more than 100 species. The weather is windy and a light mist falls. Last month it rained so much that the count had to be called off after lunch. But not before they could record 70 different species – typical for a normal day and excellent for half a day. The final tally for the day comes in at 55 species and 347 birds. Fewer species than normal, but more total birds. The wonder of this biodiviersity translates into benefits for the surrounding areas as well. One of the most remarkable changes over the years has been the increased number and variety of species as a result of reforestation projects. The planting of more than 28,000 trees in the area (as of the end of 2012) has created bridges between forested areas that had been separated by pastures. 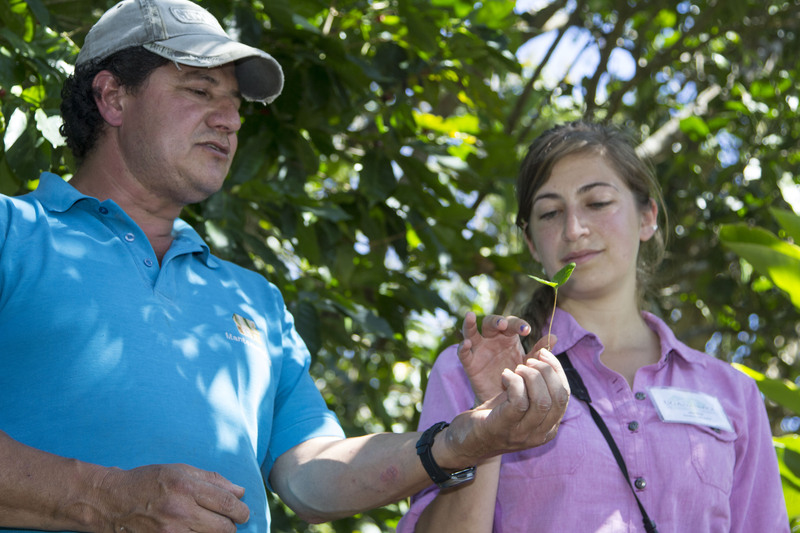 Alvaro Vega (left) shows naturalist Lillie Kline a young coffee plant on his farm in Finca La Bella. And more connectivity means more birds for farmers like Alvaro Vega, whose organic coffee trees rely on natural means of pest control. More birds visiting his farm can translate into fewer insects and greater yields. A recent study of Finca La Bella, where his farm is located, revealed it was visited by more than 200 bird species in a single year. The reforestation project works with local farmers who are interested in planting trees on their land. A variety of native species are used, from fruiting trees to those best suited for wind protection. During our hike, one of the guides pauses to make a bird call and we all stay quiet and wait. There’s a plaque outside the front office with the program’s vision of, “a world in which human and environmental systems are not seen as separate and operate in harmony with one another,” written on the wall. And with a whistle of an answer from the bushes, those words have never spoken louder. Anyone who has visited the UGACR campus has experienced both the ubiquity and intense productivity of our leafcutter ants. Day after day, night after night, the tenacious leafcutter workers, all of whom are female, tirelessly carry leaf fragments back to their colonies on well-worn trails. Found only in the Neotropics, leafcutters have developed a novel way in which to feed themselves: through cultivation. The farmers of the insect world, leafcutters clip pieces of leaves from a variety of plants, which they then carry back to their colonies and use to cultivate a fungus. This fungus constitutes the majority of their diet. The ants and their fungus rely entirely on each other for their continued existence, exhibiting a type of symbiotic, or mutually beneficial, relationship called obligatory mutualism. Leafcutters, however, are not the only ants that cultivate fungus as their principal food source. 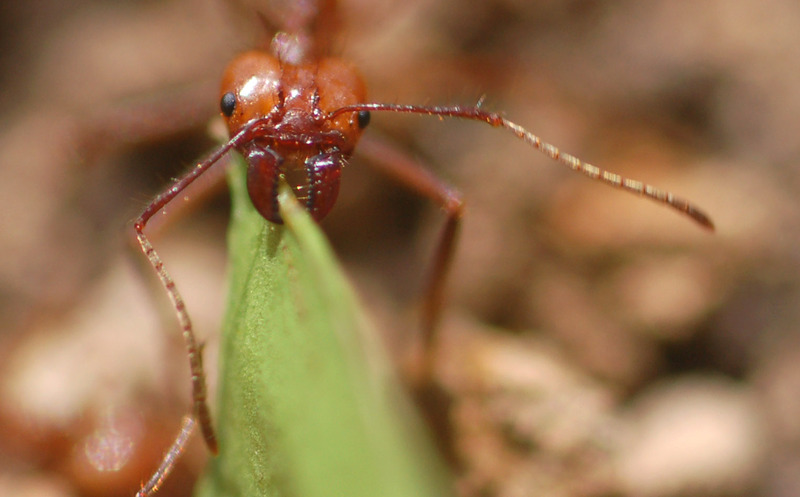 In fact, nearly 200 species of fungus garden ants exist, only 37 of which are leafcutters. Some of these symbiotic relationships between the ants and their fungi may even be as old as 50 million years. Remarkably, each of these species cultivates its own unique fungus found only in the colony of that species! While leafcutter ants grow their fungus in underground chambers, other fungus garden ants farm on decaying organic matter. Though you’ll find the majority of these fungus garden ants in the tropics, they may also occur in temperate and subtropical grasslands, with one species even occurring as far north as New Jersey. 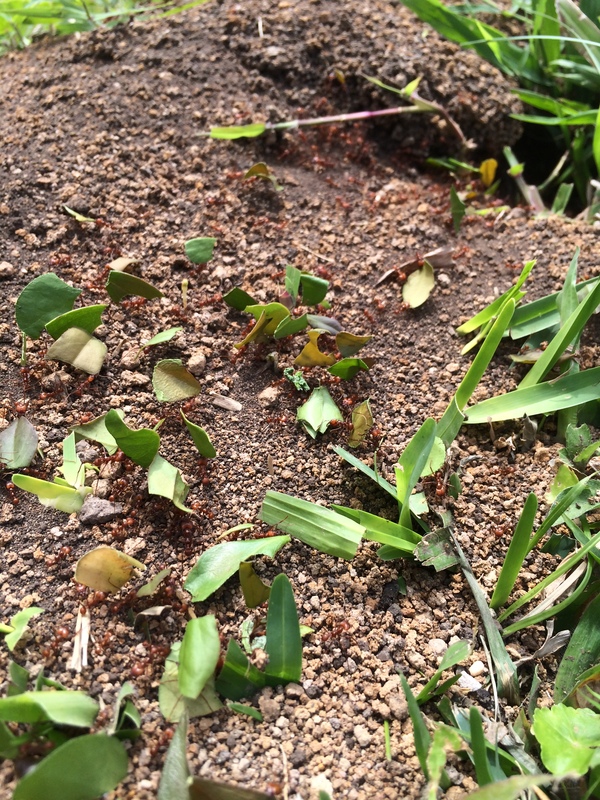 Fungus garden ants are inextricably linked to their fungi and are only one example of the many important ecological relationships to be observed here at UGA Costa Rica. Well we had planned on revealing the new Costa Rican president to you today, but in a shocking turn of events, the election was inconclusive! It was too close. 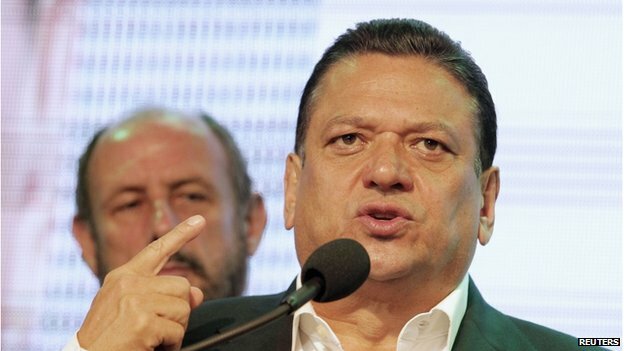 Citizens Action Party candidate Luis Guillermo Solís had 30.95 percent of the votes, while the candidate of the National Liberation Party Johnny Araya got 29.59 percent. The results indicate that a second round of voting must be held April 6th, as neither of the top candidates got 40% of votes (the minimum to be declared the winner). 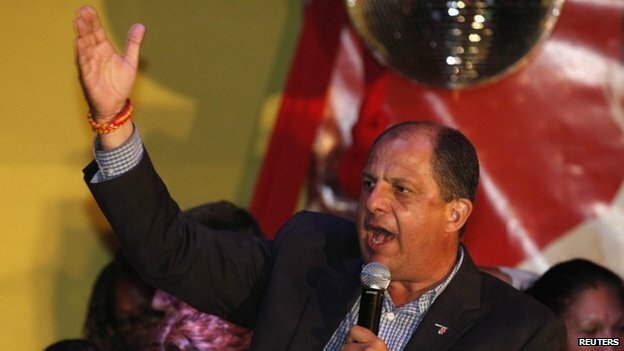 Citizens Action Party candidate Luis Guillermo Solís. 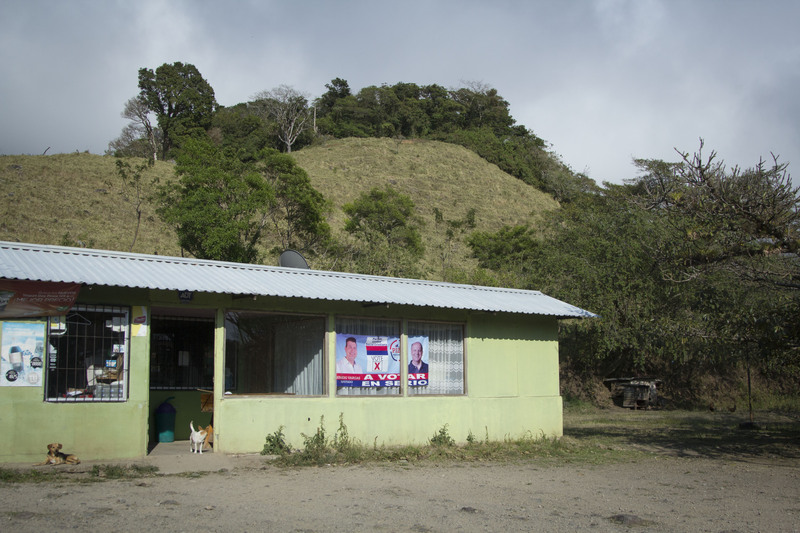 This was also the first year that Costa Ricans abroad could vote in the election. However, the turnout was less than stellar. Out of 12,654 registered voters living outside of Costa Rica, only 2,771 actually cast a vote. The Supreme Elections Tribunal authorities have a couple of theories as to why the turnout was low: the weather at some of the major voting polls in the US was pretty brutal, the elections occurred at the same time as the Chinese New Year celebration, and perhaps most influential was the fact that they coincided with the Super Bowl! The biggest polling station in the US was in New York City, and Super Bowl traffic hindered transportation. National Liberation Party candidate Johnny Araya. Who knew, right? I guess we’ll keep you updated. Tune back in around April 6th for further developments! Wanna see another fun thing? This music video celebrates CR’s elections and democratic tradition. Ever wondered what kind of wildlife you might see at the UGA Costa Rica Campus? Well we took the liberty of compiling a slideshow of a few of the animals that have been spotted around campus in the last month. Enjoy our Campus Wildlife Sightings!! !